Update: Reposted again so that it stays on the front page for a few days longer. 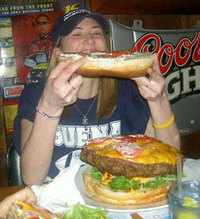 Here's a selection of images of the 100lb woman who ate the 6lb burger. Update (04/02/05): Here's a video clip of the huge burger. 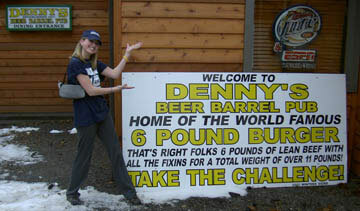 Update (3/5/05): If you are looking for the new burger from Denny's click here. Update (3/5/05): Here's a possible image of the new burger. Update: Here's an image of the giant new burger. Update (9/05/05): Here's a new picture of the giant burger. Not sure I could afford a girlfriend with that appetite. Not unless free burgers were the only thing she ate! Would you marry me? How hot is that? I want to know how things came out. Was she allowed trips to the bathroom? 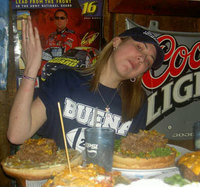 If so, she could easily 'polish' off a burger like that. Ahem, just make a little room and add more!! Go bulimia! Katie ur my hero !!! What wud i do with out u!!! That's just so cool I can't find the words to describe it. Incredible. Cheers from Sweden! Did the judges check for tapeworms? Damn! You liar!!! No way-Investigation immediately!! wow! that "IS" hot! absolutely amazing. i'm sure it's just one of many tallents, but still very impressive. Just a burger? I mean, where are the fries? I'm stunned. After hearing the news and seeing your picture(MAMA CITA!! ), you are obviously out of my league but if you're ever slumming in Michigan look me up. I'd love to take you to dinner. 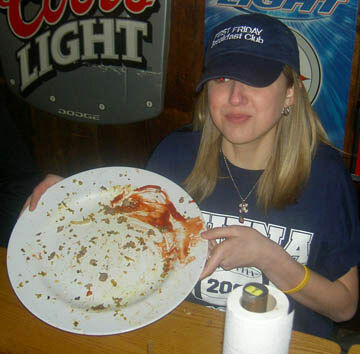 Could she eat a 12.5 pound pizza? The pizza restaurant owner will pay her $100! Saw it on Food Network yesterday. I couldn't have done it better myself! I don't want to be around her after the digests. I wonder if she likes IDB? how can anyone say she's hot? She's a PIG! thats sick!! !